The Ark is finished! We towed it into place on the night before Christmas Eve. Moving it was a whole family affair: Junior rode on my back while I drove; Rosebud took pictures; the Moose appointed himself inspector. Mr. Caffeinated provided the brawn. I don’t remember what Natter did. 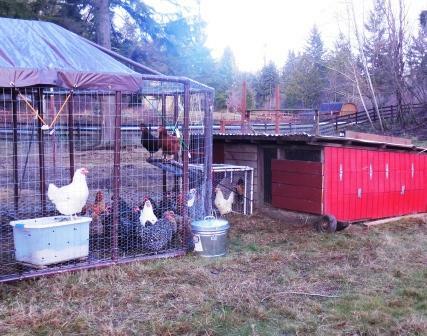 The chickens finally have living space that is hawk-proof (we lost one to a hawk at Thanksgiving), dog-proof (we hope), easily moveable (with the tractor), and is partially covered so that they can get some sun but have somewhere out of the rain to play. When we get all our add-ons done, we’ll be able to feed and water them from outside the coop! Obviously, we’ll be going into the coop frequently… but on those days when we’re in our church or town clothes and need to do the chores quickly without getting dirty, this will be really convenient. Each bird has over 10 square feet of living space. Not that they spread out a whole lot… but they have room to eat grass, run around, fly a bit (they can’t get far, even when they aren’t in the Ark), dust bathe (that’s what the white tub is for), and generally be their own little chicken selves. We plan to move the ark once or twice a week, depending on the weather and how fast they wear out the grass. We can house up to 30 birds in this arrangement. 1. 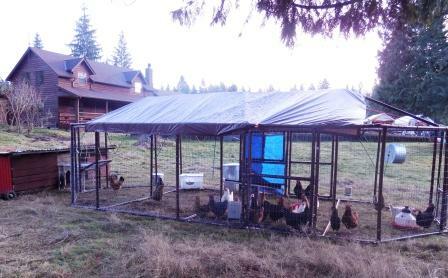 Chicken tractors are generally smaller, for 3 – 7 birds. Since ours is considerably larger, we felt like it deserved a larger-sounding name. So – I blame it on the hens. They named it! This entry was posted in Pastured Poultry, Projects, Uncategorized and tagged 30 birds, 30 chickens, big chicken coop, chicken ark, chicken coop, chicken tractor, giant chicken tractor, homemade chicken tractor, portable chicken coop. Bookmark the permalink. Our first coop/tractor set is for three birds. We used it when we still lived in Kirkland. We started out with three, to get our feet wet, and I’m very glad we did! That was the perfect number for us, for learning on. After the first year, we felt we were ready to branch out to a larger flock. it and also added in your RSS feeds, so when I have time I will be back to read a great deal more, Please do keep up the excellent job. It’s going to be end of mine day, however before ending I am reading this great post to increase my know-how. Of the move, or of the Ark itself?